The Canon EOS 5D Mark IV, a new professional digital SLR camera, features a 30.4 megapixel CMOS sensor, 7fps continuous shooting with full AF/AE tracking, internal 4K movie recording (4096 x 2160pixels) at 30/25/24 fps and 8.8 megapixel in-camera 4K still frame grab, an expandable ISO range of 50-102400, 61 focusing points with 41 cross-type AF points plus the ability to to use extenders with all telephoto lenses for f/8 AF with all 61 points ( including 21 cross type), focusing in light as low as -3 EV or -4 EV in Live View mode, 150,000-pixel RGB+IR metering sensor, 3.2-inch touchscreen with 1,620k dots, a new AF ‘Area Selection’ button, and built-in Wi-Fi, NFC, secure file transfer (FTPS/FTP) and GPS. The 5D Mark IV is also the first EOS camera to offer the Dual Pixel RAW file format, which allows you to fine-tune images in post-production by adjusting or correcting the point of sharpness, shifting the foreground bokeh or reducing image ghosting. The Canon EOS 5D Mark IV retails for £3629 / €4899 / $3499 body-only. The 5D Mark IV is once again very similar to its predecessor in terms of appearance and being very slightly smaller (150.7 x 116.4 x 75.9mm) and weighing 50g less (890g in total) than the previous Mark III version. The 5D Mark IV has a magnesium alloy body, which should make it more durable in the longer term than plastic-bodied cameras, and it also includes a welcome level of weather-proofing for protection against dust and moisture. There’s a textured area on both the deep hand-grip and around the thumb-rest on the rear of the camera, and size-wise the 5D Mark IV is perfect for everyone with normal to large-sized hands. On the front of the 5D Mark IV is an infrared port on the grip, depth-of-field preview button, self-timer lamp, relocated port for a remote shutter release, and a monaural microphone underneath the camera logo. Like other semi-pro cameras, the Canon EOS 5D Mark IV offers two control wheels and with a small one on the top of the handgrip, and a large, spinning dial on the back of the camera. This rear ‘quick control dial’ is characteristic of all high-end Canon EOS cameras, used to apply rapid exposure adjustments. It’s a bit of an acquired taste compared to more conventional control dials, but you quickly get used to it and it is easy to ‘spin’. There’s a dedicated Lock switch which toggles the effects of this dial on and off. The quick control dial does take up the space where you’d normally expect to find a four-way controller, which means that for menu navigation Canon has incorporated a small joystick on the back of the camera. This joystick works well enough, but it’s not as positive or as easy to use as a conventional four-way controller. 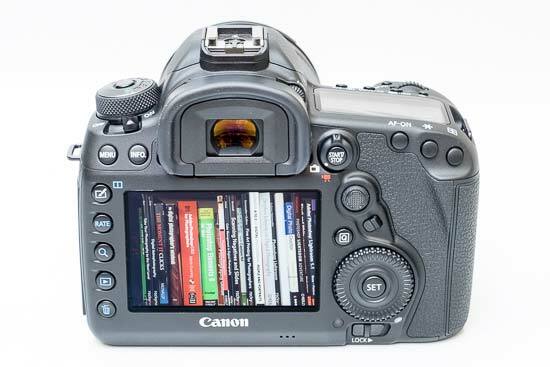 There’s a brand new AF area selection button on the back of the EOS 5D Mark IV which makes it easier to switch the autofocus point when holding the camera to your eye. Underneath this is the Quick button which opens the Quick Control screen, which is particularly well-suited to beginners and tripod work. Depending on which shooting mode you’re using, this lets you set various parameters via the LCD screen, using the joystick to move around the various options. The 5D Mark IV is the latest EOS camera to feature a touch-screen. It supports a variety of multi-touch gestures, such as pinching and swiping, for choosing shooting modes, changing settings, tracking faces, selecting auto-focus points, and focusing and taking a picture in Live View mode. In playback you can swipe to move from image to image and pinch to zoom in and out, just like on an iPad or other tablet device. The ability to focus and take the shot with a single press of your finger on the screen makes it quick and easy to capture the moment. 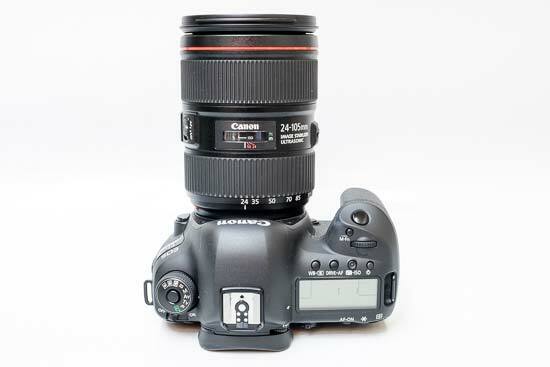 On the top-right of the Canon EOS 5D Mark IV, positioned above the large monochrome status LCD display, are three buttons, each of which has two functions. You press a button and then turn either the top dial or the rear dial to change the corresponding setting. It does take a little while to memorise which button does what, and which dial you need to turn. The 5D Mark IV also shows the settings on the main LCD screen as well as the status LCD. There’s a smaller fourth button which activates the status LCD display light so that you can use it in the dark. There are two LCD displays on this camera; the 3.2-inch colour LCD on the rear and the smaller status panel on the top. On cheaper DSLR cameras, the LCD on the rear usually has to do both jobs, but on this model all of the camera’s main settings are visible from above on the smaller panel. This makes the Canon EOS 5D Mark IV quicker to use and also helps to extend the battery life. The main LCD screen offers a fantastic VGA resolution with 1,620K dots, so you may find yourself using it more often than you thought. Importantly it also allows you to judge the critical sharpness of your photos using the LCD screen. The viewfinder offers 100% coverage with a magnification of 0.71x and dioptre correction. Like most DSLRs aimed at prosumers, the EOS 5D Mark IV offers all the usual serious manual and semi-automatic shooting modes for users who want more advanced exposure control, via a chunky and positive dial on the top-left of the camera body, complete with a central lock button to prevent the dial from inadvertently moving. Canon refers to these advanced operations as the ‘creative zone’ and provides all the normal settings including Program, Aperture and Shutter Priority and the full Manual mode. There is also an auto shooting mode aimed at beginners called Scene Intelligent Auto, which allows you to change just a few key settings using the LCD screen, with the camera automatically setting both the aperture and shutter speed for you. The 5D Mark IV’s power switch is located underneath the shooting mode dial. Over on the other side of the camera is a Multi-Function button, positioned next to the shutter release button. The M-Fn , or Multi-function, button toggles through the five different AF area choices after pressing the AF Point select button. The AF areas are Manual AF, Spot AF, AF point expansion, Automatic AF point selection and Zone AF, and they can also be selected via the Quick Control Screen menu. Once the EOS 5D Mark IV is in one of the ‘creative zones’, users can adjust the ISO setting into one of 12 positions from 50 to 102,400 (you need to to enable the ISO 50, 52000 and 102,400 modes via the “ISO expansion” custom function option). This massive ISO range allows you to shoot in almost any lighting conditions without having to resort to using flash, which is good news as the 5D Mark IV doesn’t actually have a built-in pop-up flash (you’ll need to budget for an external flashgun). The EOS 5D Mark IV offers a range of three Auto focus modes (One Shot, AI Focus and AI Servo), and there are six preset, auto, kelvin and custom white balance options. The viewfinder displays all key exposure information including the ISO speed, and there are four metering modes including a tighter 1.5% Spot metering mode, useful in tricky lighting conditions as an alternative to the excellent and consistent Evaluative metering system. The 5D Mark IV a 61-point auto-focus system, with no less than 41 of them being cross-type points, helping to ensure that moving objects remain in focus. There’s also a whole AF menu dedicated to fine-tuning the 5D Mark IV’s autofocus system, with a range of customisable AF pre-sets helping you to deal with different subjects. Autofocusing is very swift in a wide range of different conditions, including lower light. It doesn’t seem to matter which lens is attached to it, but if you are using professional “L” lenses then you should find that focusing is near instant in good light, taking a touch longer in low light conditions. The sensitivity has been increased to -3EV, compared with the -2EV of the previous 5D model, which makes it more responsive in darker conditions. Further good news is that all 61 of the Canon EOS 5D Mark IV’s AF points can focus at f/8, which is useful for wildlife photographers who are using long lenses and/or extenders. The menu system is the same as on most EOS cameras, utilising a simplified tab structure that does away completely with scrolling. There are 6 main menu options, each containing up to 5 individual tabs of options. You can also setup your own customised menu page for instant access to frequently used settings via the My Menu setting. Only the complex Custom Functions and AF menus detract a little from the overall usability. Thankfully the documentation that comes with the 5D Mark IV is clear enough, as it is with all Canon cameras, if a little light on detail. You do get a the manual in English throughout and you’ll find most things that you need to know about the camera’s operation in here, without the need to search through the supplied CDs for an ‘electronic’ manual. The Canon EOS 5D Mark IV features built-in wi-fi connectivity, which allows you to share images during playback via the Wi-Fi menu option. Enable the Wi-Fi menu option and the Wi-Fi Function option appears underneath, which contains six icons. The 5D Mark IV can connect to another camera, a smartphone, a computer, a printer, the internet and a DNLA device respectively. Setup is long-winded but relatively straight-forward for each scenario, although you’ll need a basic understanding of the protocols involved (or consult the supplied User Guide). Note that you need to install the dedicated and free EOS Remote app to connect the 5D Mark IV to the world’s most popular smartphone, or the Apple iPad and iPod Touch, or an Android device. You can then use your smartphone or tablet to remotely control almost every aspect of the camera’s operation, review images on a larger, more detailed screen and to transfer images between devices. The 5D Mark IV can tag your images with GPS data (latitude, longitude, altitude and shooting time) just like many of the company’s compact cameras. We prefer having GPS built into the camera rather than having to sync it with an additional device, although it does consequently suffer from the issue of negatively affecting battery life. The EOS 5D Mark IV also has built-in NFC, which allows you to quickly transfer images to a compatible smart device by simply tapping them together. We tested the EOS 5D Mark IV with the new EF 24-105mm f/4L IS II lens, which is offered as a kit lens in some regions. This combination offered fast, positive autofocus, can track moving subjects very well and is also near-silent, and we’d recommend that you choose this kit if you’re buying into the Canon system for the first time. The 24-105mm lens also crucially features image stabilisation. This is important for Canon, as some competitors cameras feature image stabilisation that’s built-in to the camera body, which therefore works with their entire range of lenses. Canon’s system is obviously limited by which lenses you choose, but it does offer the slight advantage of showing the stabilising effect through the viewfinder. The EOS 5D Mark IV features the latest DIGIC 6 image processor, which produces noticeably faster image processing, start-up and image review times than the previous 5D Mark III camera and better noise reduction in high-ISO images. DIGIC 6 also allows the 5D Mark IV to shoot slightly faster than the previous model, obtaining a speed of 7fps for for up to unlimited number of JPEGs or 21 RAW images. 14-bit A/D conversion, in-camera HDR processing, multiple exposure function and in-camera RAW processing are also enabled by the Digic 6 processor. Battery life is rated to CIPA standards at 900 shots using the viewfinder, or 200 shots in live view mode. This can be doubled by using the optional BG-E20 battery grip which takes two LP-E6/LP-E6N batteries. The 5D Mark IV has an identical Live View system to its predecessor. If you’re new to DSLRs and don’t understand the terminology, basically Live View allows you to view the scene in front of you live on the LCD screen, rather than through the traditional optical viewfinder. This is an obvious attraction for compact camera users, who are familiar with holding the camera at arm’s length and composing via the LCD screen. It’s also appealing to macro shooters, for example, as it’s often easier to view the screen than look through the viewfinder when the camera is mounted on a tripod at an awkward angle. There are three types of focusing system on offer during Live View shooting. The first, Quick AF, works by physically flipping the camera mirror to engage the auto-focus sensor, which then momentarily blanks the LCD screen and causes a physical sound, before the image is displayed after about 1 second. The other methods, Live AF and Live AF with Face Detection, use an image contrast auto-focus system, much like that used by point-and shoot compacts, the main benefits being the complete lack of noise during operation, and no LCD blackout. Unfortunately these are much slower than the Quick AF mode, taking over 3 seconds to focus on a clearly-defined subject in bright light, which will put off most users that are attracted by the promised point-and-shoot experience. On a more positive note, you can move the AF point around the screen, and the 5D Mark IV successfully detected faces in most situations. 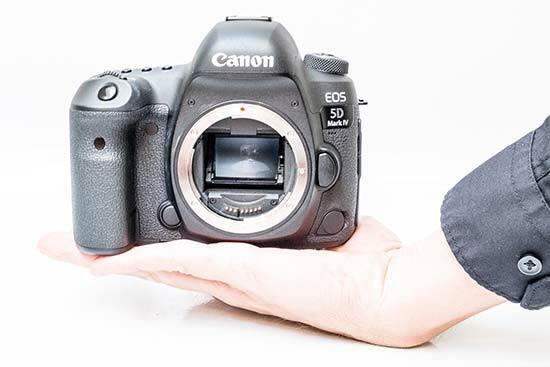 To move into the Canon EOS 5D Mark IV’s video recording mode, you need to push the switch near the viewfinder across to video recording and then press the Start/Stop button. To change the recording quality, you can press the Q button and switch between the 4K options and the full HD options. It’s worth noting that if you’re shooting in 4K you will be limited to a maximum ISO of 12800. You can shoot for a full 29 minutes and 59 seconds when using the EOS 5D Mark IV. This is down to a heat pipe which draws heat away from the camera’s sensor and facilitates such long recording times. You also of course have full manual control. That’s not to say that the video options here are perfect – it’s not possible to record 4K when outputting via the HDMI cable, so professional videographers may still be put off. If you record something in 4K, it’s possible to extract stills from the resulting video in camera. Playback the video and you’ll see an option called “Frame Grab”. This will allow you to save a 8.8 million pixel JPEG image from the video you have recorded. This has some useful applications for high frame rate recording of fast moving or unpredictable subjects – if you only need a relatively small (but still printable at A3) image, then it may be preferable to shoot in 4K and extract an image than to use traditional stills shooting. Dual Pixel RAW is a new feature that takes advantage of the 5D Mark IV’s so far unique dual photodiode construction. Essentially during Dual Pixel RAW shooting, a single RAW file saves two images into the file, one containing the normal image and the other any parallax information, which can be measured and the subject distance information extrapolated. Using the Dual Pixel RAW Optimizer in Canon’s Digital Photo Professional software (v4.5 or later), you can then adjust or correct the point of sharpness, shift the foreground bokeh or reduce image ghosting. In practice we found that the possible adjustments were quite small, and Canon themselves state that you should “shoot at a lens focal length of at least 50mm and an aperture of f/5.6 or lower, ensuring the ISO value is 1600 or lower” to achieve the best results. Also, for technical reasons, only one of these adjustments can be performed on a Dual Pixel RAW file per processing session. Note that turning on Dual Pixel RAW increases the file size of each RAW file you shoot from about 35-37Mb to roughly 65Mb, and the number of continuous shots you can take drops from 21 RAW images to about 7. More useful, especially if you have a number of older lenses, is the AF Microadjustment feature that has trickled down from the pro DSLRs. This allows you to alter the focus of each lens, then use a focusing target to test if the lens focuses correctly, and if it doesn’t, alter it slightly using the AF Adjustment option, then test again until perfect focus is achieved. With most other DSLR systems you’d have to send the camera and lens off for calibration (and maybe even have to pay for it), but with the 5D Mark IV, you can calibrate all of your lenses in the comfort of your own home (up to 20 lenses can be stored in the camera). The EOS 5D Mark IV features a silent shooting mode that reduces the sound of both the shutter and mirror, perfect for situations where you don’t want to draw unwanted attention to yourself. A continuous silent mode is also available, although its at a slower rate of 3fps than the headline 7fps mode. The EOS 5D Mark IV implements the same dust-removal technology as its predecessor, where the sensor is shaken briefly at high frequency to dislodge any dust particles from its surface. This could delay the need for manual sensor cleaning, perhaps indefinitely, but it won’t be able to remove ‘sticky’ deposits like salt spray, pollen or the smears left behind by careless sensor cleaning or the wrong kind of solvent. 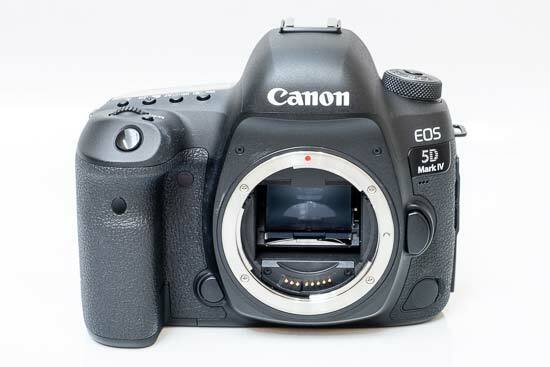 The 5D Mark IV also inherits the internal Dust Delete Data system from the 5D Mark III, which can map the position of visible dust on the sensor. This can then be deleted automatically after the shoot with the supplied Digital Photo Professional software. Peripheral Illumination Correction is a feature that’s actually a lot simpler that it initially sounds. Basically it corrects the unwanted effects of vignetting, typically seen in wide-angle photos in the corners of the frame. The 5D Mark IV contains a database of correction data for various Canon lenses and, if Peripheral Illumination Correction is enabled, automatically applies it to JPEG images. For RAW images the correction is applied later in the Digital Photo Professional software. Up to 40 lenses can be programmed into the 5D Mark IV, with over 80 currently available to choose from. Peripheral Illumination Correction is a useful and effective addition, particularly for JPEG shooters, and can safely be left turned on all of the time. Once you have captured a photo, the Canon EOS 5D Mark IV has a range of options for playing, reviewing and managing your images. More information about a captured image can be seen on the LCD by pressing the Info button, which brings up a brightness image histogram and all the shooting Exif data, including shutter speed and the time and date it was captured, with a second press displaying an additional RGB histogram. Highlight Alert and AF Point Display can also be turned on via the Playback menu. It is simple to get a closer look at an image as you can zoom in up to 15 times, and it is also possible to view pictures in a set of nine contact sheet. Pressing the Creative Photo button displays two images side-by-side to allow you to compare the quality of different exposures on the camera. You can also delete an image, rotate an image, view a slideshow, protect images so that they cannot be deleted, and set various printing options. Unlike some competitors, there are no digital styles or effects that can be applied to an image after it has been taken – the more subtle Picture Styles are the only way of tweaking your JPEGs in-camera, before they are captured. In-camera image rating via a new dedicated button on the rear makes it easy to organise your images ahead of post-production, with the rating maintained in IPTC-friendly software. The Canon EOS 5D Mark IV’s software suite is very good. Admittedly, photographers who’ve graduated to a camera like this one will almost certainly have chosen image browsing and editing software already, so they won’t need the basic image browsing program included here, but there’s more than that. You also get Canon’s simple but effective PhotoStitch application for making panoramic shots, a utility for using the 5D Mark IV remotely (while tethered to a PC) and Canon’s Digital Photo Professional application for converting RAW files. This is a big bonus, because other makers don’t always include such good RAW conversion software. Digital Photo Professional certainly isn’t the best RAW converter on the market, but importantly does mimic the camera’s Picture Styles ‘retrospectively’. In addition the supplied Picture Style Editor software can be used to create custom Picture Styles on your computer instead of in-camera.